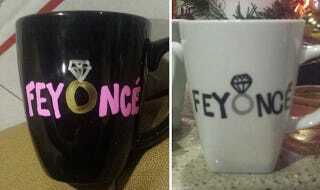 Beyoncé, supporter of marriage, is not cool with these fake Etsy engagement mugs with her almost-name on it. Nice try. The singer felt the pun was more than coincidental — right down to the accent on the last "e" — so her lawyers fired off a letter to the company crying foul ... and then threatening them. Etsy got the message and took the items off the artist's online shop. But all is not well. Etsy still has other feyonce items on it's site, including clothing and glassware. And these items are selling big. Get your Feyoncé regalia while it still lasts. Beyoncé is coming.